Lhatsün Namkha Jikmé (Tib. ལྷ་བཙུན་ནམ་མཁའ་འཇིགས་མེད་, Wyl. lha btsun nam mkha' 'jigs med) (1597-1653) was an incarnation of both the great pandit and Dzogchen master Vimalamitra, who attained the rainbow body (Tib. འཇའ་ལུས་འཕོ་བ་ཆེན་པོ་, ja lü phowa chenpo), and of the omniscient Longchenpa. He was born in 1597 at Jaryül in southern Tibet. At birth, the space between his eyebrows and the tips of his tongue and nose were all very clearly marked with the seed-syllable AH, ཨཱཿ. He was ordained as a novice by Tulku Orgyen Paljor at the hermitage of Sungnyen, and given the name Kunzang Namgyal. At first, he studied at the shedra of Thangdrok, where he received empowerments and teachings on many profound practices, and instructions from many accomplished masters. He particularly practised the Kagyé (the ‘Eight Great Herukas’) and Lama Gongdü, completely mastering all the accomplishments and enlightened activities of these practices. He then studied for seventeen years with the Dzogchen master Sonam Wangpo, receiving the complete instructions of Nyingtik, the essence of the Dzogchen teachings, through which he ‘plumbed the depths of realization’. From Ngawang Mikyö Dorje he also received thorough instruction on the profound and secret yogic practices known as ‘the path of skilful means’ (Tib. ཐབས་ལམ་, tab lam), and its attendant activities known as ‘the disciplined conduct of awareness’. He became a supreme practitioner of these; many lamas consider that since his time no one has displayed such complete mastery. He spent many years practising in some of the most remote and sacred pilgrimage places of central and western Tibet, perfecting his accomplishment. Through this he was able to completely unravel the knot of the energy channels in the throat centre; afterwards every word he spoke was always refined and full of meaning. He subdued an extremist heretical king in India and established him in the Dharma. In central Tibet, he was able to enlist the help of all the local deities to assist him in restoring the temple of Samyé. At Tsari, he stopped a huge avalanche simply by gazing at it while making the ‘threatening mudra’. During his retreats in Tibet he experienced many extraordinary ‘pure visions’. 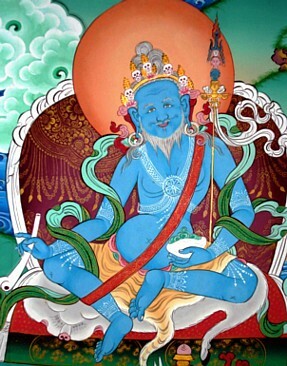 From one of these emerged one of the greatest of his termas, the Dorje Nyingpo Tringyi Tollü Chökor (The Spontaneous Song of the Clouds: the Nucleus of Indestructible Reality), which is particularly revered as a condensed summation of the inner teachings of all terma lineages. It is said that to see, hear or even just think of this teaching establishes the seed of liberation. He passed this on to just a few extraordinarily fortunate disciples. His most important teachers were the two great vidyadharas and tertöns Jatsön Nyingpo and Düddul Dorje. At their urging, following a prophecy that to do so would be of great benefit for the Dharma throughout the Himalayas, in 1646 Lhatsün went on foot to Lhari Ösel Nyingpo in Sikkim. Here he founded a temple and hermitage, establishing it as one of the most sacred places of pilgrimage in the Himalayas. In accordance with an earlier prophetic declaration of the dakinis, the famous cycle of terma teachings called Rigdzin Sokdrup, ‘Accomplishing the Life-Force of the Vidyadharas’, emerged in a pure vision while he was in retreat in the cave of Lhari Rinchen Nyingpuk at Drakkar Tashiding. These teachings, of which Riwo Sangchö forms the mengak or innermost instruction, are unsurpassed instructions on Dzogchen Atiyoga. Through his practice of Riwo Sangchö, Lhatsün was able to remove all human and non-human obstacles to the Dharma in Sikkim, opening it as a ‘secret land’ of the teachings. Because of this, he was able to teach Dzogchen very widely in Sikkim in the remaining years of his life, establishing a vibrant and unbroken lineage that continues to this day, known simply as ‘Sikkim Dzogchen’. More than two hundred of Lhatsün Namkha Jikmé’s writings have survived. Accomplishing the Life-Force of the Vidyadharas and The Spontaneous Song of the Clouds have continued to be transmitted and practised throughout Tibet and particularly in Sikkim right up to the present day without any decline. His incarnation, Jigme Pawo (1682-?) continued his work in Sikkim. His later incarnations include the Khyentse lineage; Jamyang Khyentse Chökyi Lodrö states in his autobiography that he had clear memories of his past life as Lhatsun Namkha Jikmé, and that he had been shown the tantric disciplines by Lhatsün in a vision. Dudjom Rinpoche, The Nyingma School of Tibetan Buddhism, Its Fundamentals and History, trans. and ed. Gyurme Dorje (Boston: Wisdom, 1991), pages 818-820. Nyoshul Khenpo, A Marvelous Garland of Rare Gems: Biographies of Masters of Awareness in the Dzogchen Lineage (Junction City: Padma Publishing, 2005), pages 415-416. This page was last edited on 28 October 2014, at 10:04.